In this lesson, we will learn how to use the formula I = Q/t to calculate the current through a point in simple circuits given the charge moving past that point in a given time. The diagram shows a circuit consisting of a battery and a resistor. The current through the circuit is 50 mA. Over a period of 1.5 hours, how much charge flows past point P in the circuit? A laptop charger passes a current of 5.0 A through a laptop battery. Over a period of time, 4 5 0 0 0 C of charge is transferred to the battery. For how many hours was the laptop left to charge? The diagram shows a circuit consisting of a battery and a resistor. The current through the circuit is 2.0 A. 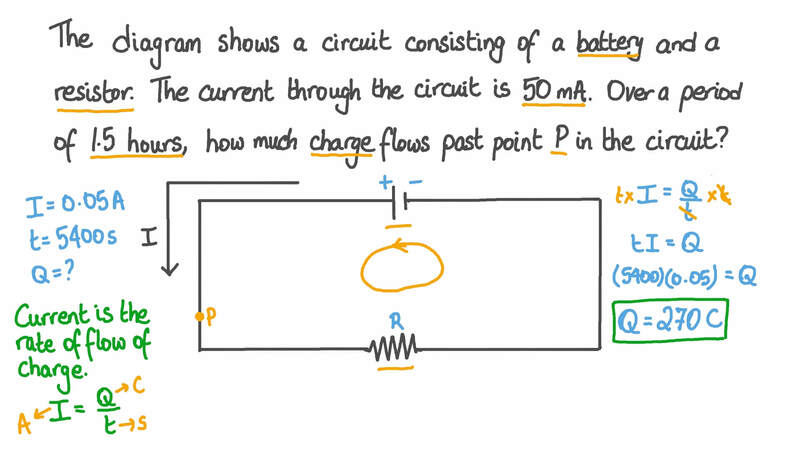 Over a period of 45 seconds, how much charge flows past point P in the circuit? Which of the following is the correct formula for the amount of charge flowing through a point in a circuit in a given time? 𝑄 represents the amount of charge, 𝐼 represents the current, and 𝑡 represents time. 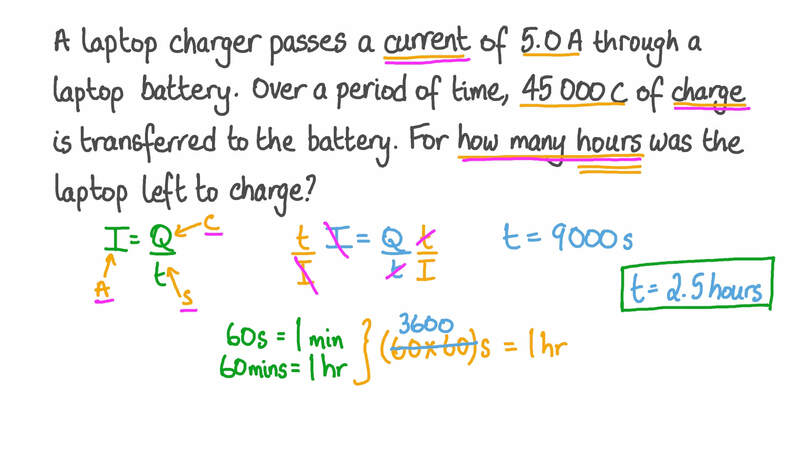 Which of the following is the correct unit for electric charge? Which of the following is the correct unit for electric current? A rechargeable battery is left to charge for a period of time. It is charged with a current of 10 mA. After it has finished, the battery has gained 180 C of charge. For how many hours was the battery left to charge? Which of the following is the correct formula for the current through a point in a circuit? 𝐼 represents the current, 𝑄 represents the amount of charge, and 𝑡 represents time. The diagram shows a circuit consisting of a battery and a light-emitting diode (LED). Over a period of 25 seconds, a charge of 50 coulombs passes through point 𝑃 in the circuit. What is the current in the circuit during this period? How many milliamperes are there in 1 ampere?